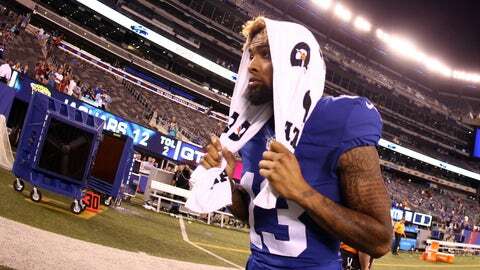 Odell Beckham Jr. insists being labeled as a "prima donna" doesn't bother him one bit. Buffalo Bills cornerback Stephon Gilmore recently called New York Giants standout Odell Beckham Jr. a “prima donna,” but the wide receiver apparently isn’t worried about the name. According to Ebenezer Samuel of the New York Daily News, OBJ said the words don’t follow him home, because he sleeps perfectly well. The press conference was a weird day for Beckham, who completely ignored the reality that he punched a Bills player in the helmet and was fined for it. Sorry, OBJ. The emotions are in fact an issue. Beckham threw a punch after Bills safety Duke Williams pancaked OBJ following a Buffalo interception. Though many people consider athletes as role models, it’s clear Beckham isn’t worried about his reputation. But, if he can still sleep like a baby after punching someone in the helmet, well, that’s his prerogative. Beckham has lost control of his emotions on multiple occasions. The Giants receiver has a weak spot, and you can bet opponents will attack it. The San Francisco 49ers are up next.